Phenylalanine, an amino acid found in many proteins such as hemoglobin, is essential in the human diet and normally is readily converted to the amino acid tyrosine in the human body. Phenylalanine (in the L-isomer form, which is the only form involved in protein synthesis) is one of the twenty standard amino acids common in animal proteins and is required for normal functioning in humans. Phenylalanine also is classified as an "essential amino acid" since it cannot be synthesized by the human body from other compounds through chemical reactions and thus has to be taken in with the diet. The intricate coordination of systems in the human body is seen in the enzyme-catalyzed process by which phenylalanine is converted into tyrosine, which in turn is converted into L-DOPA, the metabolic precursor of such other vitally important molecules as dopamine, norepinephrine (noradrenaline), and epinephrine (adrenaline). The serious disorder phenylketonuria is a disruption of such harmony due to a genetic defect that inhibits the body’s production of the key enzyme required for converting phenylalanine to tyrosine. Phenylketonuria causes mental retardation unless the syndrome is detected and treated starting shortly after birth with tight dietary restrictions. The non-carbohydrate, non-nutritive artificial sweetener and flavor enhancer aspartame (aspartyl-phenylalanine-1-methyl ester) is produced through the synthesis reaction of phenylalanine with aspartic acid and methanol. Phenylalanine's three letter code is Phe, its one letter code is F, its codons are UUU and UUC, and its systematic name is 2-Amino-3-phenylpropanoic acid (IUPAC-IUB 1983). Chemical structure of Phenylalanine. C, black; H, white; N, blue; O, red. Most amino acids have two possible different structural arrangements called optical isomers and labeled as D and L. The vast majority of amino acids functional in biological systems and therefore in proteins are L amino acids. The set of 20 L amino acids involved in forming proteins comprises the proteinogenic amino acids. As the name "proteinogenic" (literally, protein building) suggests, these amino acids are encoded by the standard genetic code and participate in the process of protein synthesis. Phenylalanine is one of the proteinogenic amino acids and characteristically only the L-stereoisomer form of it is involved in the synthesis of mammalian proteins. Phenylalanine's chemical formula is C6H5- CH2- CH(NH2)-COOH, or in general form C9H11NO2 (IUPAC-IUB 1983). Phenylalanine contains a large rigid aromatic group (in this case, a 6-carbon benzene ring) on the side chain, as does the amino acid—tyrosine—that can be produced from phenylalanine. Phenylalanine and tyrosine are hydrophobic and tend to orient toward the interior of the folded protein molecule. Phenylalanine is classified as nonpolar because of the hydrophobic nature of the benzyl side chain. Phenylalanine is a white, powdery solid. L-phenylalanine (LPA), an electrically-neutral amino acid, is one of the 20 common amino acids coded for by DNA and an essential component in the building of many proteins. L-phenylalanine is used in living organisms, including the human body, where it is an essential amino acid. L-phenylalanine also can be converted into L-tyrosine, another one of the 20 protein-forming amino acids necessary for human health, and the process can lead to such important chemical compounds as dopamine, norepinephrine, and epinephrine. D-phenylalanine (DPA), can be synthesized artificially and converted only into phenylethylamine. D-phenylalanine is a non-protein amino acid, meaning that it does not participate in protein biosynthesis. D-phenylalanine and other D-amino acids are, however, found in proteins, in small amounts, particularly aged proteins and food proteins that have been processed. The biological functions of D-amino acids remain unclear. Some D-amino acids, such as D-phenylalanine, may have pharmacologic activity. DL-phenylalanine is a racemic mixture of phenylalanine, meaning it contains equal amounts of the D and L isomers. DL-Phenylalanine is marketed as a nutritional supplement for its putative analgesic and antidepressant activities. The putative analgesic activity of DL-phenylalanine may be explained by the possible blockage by D-phenylalanine of the degradation of the enkephalins (molecules involved in the perception and regulation of pain). The mechanism of DL-phenylalanine's putative antidepressant activity may be accounted for by the precursor role of L-phenylalanine in the synthesis of the neurotransmitters norepinephrine and dopamine. Elevated brain norepinephrine and dopamine levels are thought to be associated with antidepressant effects. Phenylalanine cannot be made by animals, which have to obtain it from their diet. Phenylalanine is contained in most protein-rich foods. Especially good sources are dairy products (curd, milk, cottage cheese), avocados, pulses and legumes (particularly peanuts and lima beans), nuts (pistachios, almonds), seeds (piyal seeds), leafy vegetables, whole grains, poultry, fish, other seafoods, and some diet beverages. Phenylalanine is produced by plants and most microorganisms from prephenate, an intermediate on the shikimate pathway (Lehninger 2000). Prephenate is decarboxylated with loss of the hydroxyl group to give phenylpyruvate. This species is transaminated using glutamate as the nitrogen source to give phenylalanine and α-ketoglutarate. The genetic codon for phenylalanine (UUU and UUC) was the first to be discovered. Marshall W. Nirenberg discovered that, when he inserted m-RNA made up of multiple uracil repeats into E. coli, the bacterium produced a new protein, made up solely of repeated phenylalanine amino acids. L-phenylalanine can be converted into L-tyrosine, another one of the DNA-encoded amino acids. L-tyrosine in turn is converted into L-DOPA, which is further converted into dopamine, norepinephrine (noradrenaline), and epinephrine (adrenaline) (the latter three are known as catecholamines). The enzyme phenylalanine hydroxylase normally converts phenylalanine into tyrosine. If this reaction does not take place, phenylalanine accumulates and tyrosine is deficient, leading to the serious disorder Phenylketonuria. Since phenylalanine uses the same active transport channel as tryptophan to cross the blood-brain barrier, in large quantities phenylalanine interferes with the production of serotonin, which is a metabolic product of tryptophan. Lignin is derived from phenylalanine and from tyrosine. Phenylalanine also is converted to cinnamic acid by the enzyme phenylalanine ammonia lyase (Lehninger 2000). Following its ingestion, D-phenylalanine is absorbed through the small intestine and transported to the liver via the portal circulatory system running between the small intestine and the liver. A fraction of D-phenylalanine appears to be converted to L-phenylalanine. D-phenylalanine is distributed to the various tissues of the body via the systemic circulation. D-phenylalanine appears to cross the blood-brain barrier with less efficiency than L-phenylalanine. A fraction of an ingested dose of D-phenylalanine is excreted in the urine. There is much about the pharmacokinetics in humans that is unknown. The genetic disorder phenylketonuria (PKU), also known as Folling's disease, is the inability to metabolize phenylalanine. It is a genetic disorder characterized by a deficiency in the enzyme phenylalanine hydroxylase (PAH), which is necessary to metabolize the phenylalanine to tyrosine. When PAH is deficient, phenylalanine accumulates and is converted into phenylketones, which can be detected in the urine. These include phenylacetate, phenylpyruvate, and phenylethylamine (Michals and Matalon 1985). Detection of phenylketones in the urine is diagnostic. Left untreated, this condition can cause problems with brain development, leading to progressive mental retardation and seizures (see Biological aspects above). However, PKU is one of the few genetic diseases that can be controlled by diet. A diet low in phenylalanine and high in tyrosine can bring about a nearly total cure. Individuals with this disorder are known as "phenylketonurics." Treatment of PKU includes the elimination of phenylalanine from the diet, and supplementation of the diet with tyrosine. Babies who are diagnosed with PKU must immediately be put on a special milk/formula substitute. Later in life, the diet continues to exclude phenylalanine-containing foods. Women affected by PKU must pay special attention to their diet if they wish to become pregnant, since high levels of phenylalanine in the uterine environment can cause severe malformation and mental retardation in the child. However, women who maintain an appropriate diet can have normal, healthy children. This dietary restriction also applies to pregnant women with hyperphenylalanine (high levels of phenylalanine in blood) because they do not properly metabolize phenylalanine. If PKU is diagnosed early enough, an affected newborn can grow up with normal brain development, but only by eating a special diet low in phenylalanine for the rest of his or her life. This requires severely restricting or eliminating foods high in phenylalanine, such as breast milk, meat, chicken, fish, nuts, cheese, and other dairy products. Starchy foods such as potatoes, bread, pasta, and corn must be monitored. Many diet foods and diet soft drinks that contain the sweetener aspartame must also be avoided, as aspartame consists of two amino acids: phenylalanine and aspartic acid. Aspartame is found in many sugarless gums, sugarless soft drinks (such as Diet Coke, and Diet Pepsi), some forms of Lipton Tea, and a number of other food products. Doolittle, R. F. 1989. Redundancies in protein sequences. In G. D. Fasman, ed., Prediction of Protein Structures and the Principles of Protein Conformation. New York: Plenum Press. ISBN 0306431319.
International Union of Pure and Applied Chemistry and International Union of Biochemistry and Molecular Biology (IUPAC-IUB) Joint Commission on Biochemical Nomenclature. 1983. Nomenclature and symbolism for amino acids and peptides: Recommendations on organic & biochemical nomenclature, symbols & terminology. IUPAC-IUB. Retrieved October 19, 2016. Michals, K., and R. Matalon. 1985. 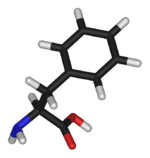 Phenylalanine metabolites, attention span and hyperactivity. American Journal of Clinical Nutrition 42(2): 361-365. PMID 4025205. Pietz, J., R. Kreis, A. Rupp, E. Mayatepek, D. Rating, C. Boesch, and H. J. Bremer. 1999. Large neutral amino acids block phenylalanine transport into brain tissue in patients with phenylketonuria. Journal of Clinical Investigation 103: 1169–1178. PMID 10207169. Retrieved October 19, 2016. All links retrieved March 19, 2019. DL-phenylalanine versus imipramine in depression. This page was last modified on 19 March 2019, at 08:36.